I like breads that are quick to make and bake. A homemade bread can be assembled and baked in the time that it takes to toss together a pot of soup or a nice salad, and that small amount of additional effort brings so much to the meal. Some yeast-leavened breads can be made quickly; I mean, check out this oaty little number. And the speed of a beer bread is hard to beat–just stir, dump, bake–but then, of course, it tastes like a beer bread. Enter soda bread, the dowdy but delicious ready-in-an-hour bread of choice in our house. Or ready-even-sooner if you follow the method I used to make these whole wheat soda bread rolls. This rye version comes from Heidi Swanson’s Super Natural Every Day, and it has many redeeming qualities. It’s made with lots of whole grain rye flour, which gives the bread a dark, attractive color, in addition to providing flavor and health benefits. More importantly, though, it truly is a stellar vehicle for the herby mash of dilled butter and goat cheese with which Swanson pairs the recipe in her book. Or, you know, just butter. Or soup. Like split pea soup. Or (what? It’s not raining anymore where you are?) a brothy springtime soup with fresh peas and asparagus. 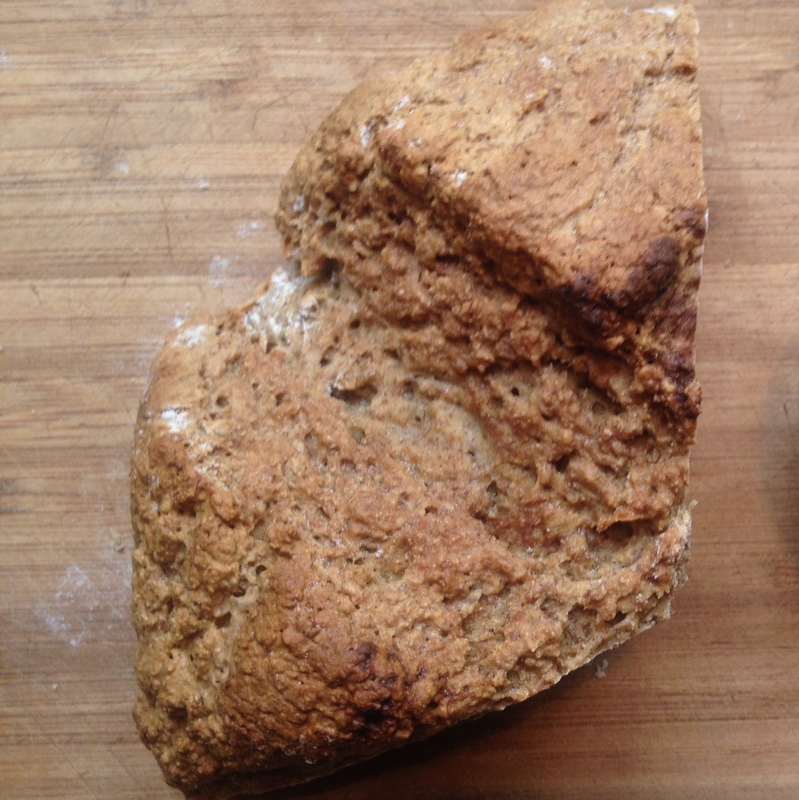 Rye Soda Bread: In a large bowl, mix 2 1/3 c. rye flour, 1 3/4 c. all-purpose flour, 1 3/4 tsp. baking soda, and 1 1/4 tsp. fine-grain salt. Make a well in the middle and pour in 2 c. buttermilk. Stir just long enough to form a dough, then turn out onto a floured countertop and knead/shape for no more than 30 seconds to form a ball. Plop the ball of dough onto a floured baking sheet and flatten the top a little (so it’s closer to a tall disc than a round ball). Brush with more buttermilk and cut 2-4 deep slashes in the dough (as if you are cutting it into wedges, but don’t cut all the way through). Bake at 400 for 45-50 minutes, or until the top and bottom of the bread both sound hollow when tapped. Cool on a rack. This entry was posted in Baking, Breads, Feeding Kids, Vegan or Would-Be-Just-As-Good-Vegan and tagged baking, bread, cooking, DIY, family, food, healthy, homemade, kids, lifestyle, recipes, soup, vegan, vegetarian, whole grain on May 2, 2012 by emmycooks. Beautiful again Emmy! Great idea for when you don’t have hours to wait for bread to rise. I just realized I never got back to you on nutritional yeast. I will go back through your posts and find your questions. Sorry! ;) checking it out now! Oooh! I have been wanting to try that bread! Yours turned out terrific! It’s good. And I like how she uses different flours and adjusts the ratio of liquid so each recipe comes out right!